Learn more about how helicopters can benefit your agricultural operation in New Mexico. Affordability meets sustainable farming, when it comes to helicopter-facilitated aerial application packages exclusively with licensed helicopter providers. Gift yourself the capacity to cover more crops in a fraction of the normal time, all from a vantage point that allows pilots a holistic perspective of your prospective harvest. Trained pilots regularly serve the New Mexico area, allowing farmers the opportunity to focus on more pressing ventures. The future of agriculture aviation frees farmers from the burden of laborious crop dusting, fungicide distribution, even watering! 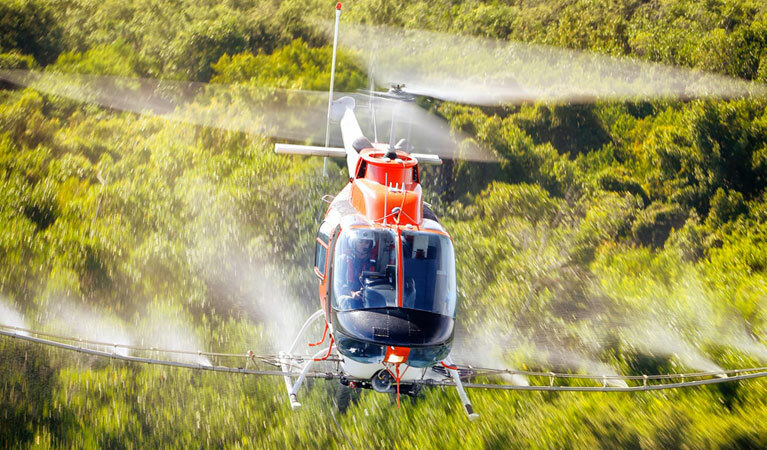 From seed sprays to frost prevention, helicopters do it all from above. New Mexico plays host to a variety of crops, all of which would benefit from the introduction of helicopter-assisted aerial applications. Leverage your harvest with the vertical element provided by aircraft, to instantly transform a challenge into an opportunity. The Land of Enchantment is home to staple crops, all of which contribute in sustaining American ingenuity. Among these crops is a healthy supply of potatoes, beans, and pecans, together with hay and onions. With varying maturity periods and necessities during growing seasons, one farming staple remains necessary: the distribution of chemical applicants, enhanced by helicopter. A wide portfolio of available aerial application services is available for your perusal. Select the right package for your individual agricultural needs, to put a dedicated helicopter provide to work on your respective fields! It’s time to augment your existing agricultural outlook in New Mexico. From the spreading of fungicides and fertilizers to the watering of your crops, so much can be accomplished through the air. One of the staple services provided by helicopter with regard to agriculture is crop dusting. Distribute chemical and natural applicants across greater areas in less time, when you take an aerial approach! Sow seed sprays when your efforts are untethered to the ground, suspended by helicopter for the enhanced crop dusting procedures that your fields deserve. Don’t give mosquitos or assorted pests half a chance when it comes to the life of your crops. Mosquitos and pests alike can easily compromise the quality of your crops. Come harvest time, you’re left yielding only a fraction of your expected output. With aerial application services in New Mexico by helicopter, you’ll easily eradicate even the peskiest pests, leaving your fields free of crawling obstacles. Your crops need protection from insect invasion; remove the pest threat by helicopter today! Naturally-growing obstacles can also prove a verifiable threat for your crops. Brush and weeds alike tend to force their way into your fields, where they make a home among your crops. From there, it’s easy for weeds to threaten the lifespan of your harvest, stealing natural resources in the soil and making space a hot commodity. Provide your crops with the freedom to grow and mature, by removing brush and weeds from the air, by helicopter! Your crops also need the protection to survive the elements. Whenever the frigid or humid outdoors threaten the life of your fields, it’s time to turn to aerial application techniques. You can cover the entirety of your fields with frost prevention and or weather treatments, thereby allowing your crops to see harvest. Guard against inclement weather and less-than-ideal climate patterns, by anticipating the conditions with frost prevention and treatment applications by helicopter in New Mexico. Your harvest deserves protecting from above. Aerial application packages in New Mexico are both affordable and efficient, and you can make one your own with a call to a customer service agent today! You can also fill out an online contact form today and expect an expedient response within 24 hours.